Post-It Notes are one of the greatest office product inventions of our time. Let’s face it, how many products that are truly office supplies, not office technology or office equipment, have really revolutionized the way we do our work? Pens, pencils, paper clips, staplers, folders, binders, etc. have all been basically the same for decades, but Post-It Notes have changed the way we work. The ubiquitous Post-It Note was somewhat accidentally invented by 3M chemist Art Fry, using an adhesive developed by Spencer Silver in the mid 1970’s. The Post-It note was originally called “Press ‘n Peel”, but poor sales in test markets caused marketing changes, a new name, and some massive sampling campaigns by 3M to get the product into the hands of workers. That sampling program was the critical marketing element that created an office supplies superstar, because people who tried them loved them. 3M continually keeps growing the Post-It brand with great products to help you Do Good Work like Post-It Flags. By the early 1980’s, Post-It Notes were stocked at most office products dealers, and a star was born. 3M dominates the self stick note category, even though their patent for the adhesive expired in the 1990’s. That dominance is driven by three major advantages that 3M enjoys. First, the product simply works better. Many office products companies have tried and failed to copy the Post-It adhesive, from Avery and Ampad, to Rediform and Zip Notes. The truth is no one has perfectly mastered the “repositionability” of the Post-It, while still keeping the paper notes from curling. Next, 3M was the innovator and the first to market, and did a great marketing job. Usually the one who brings innovation to the market first is the one who wins out in the end, (see Apple). Third, 3M does an incredible job extending the product line, and adding freshness and relevance to the Post-It note brand. Often times companies attempt to extend brands with mixed results and a loss of focus, but 3M has invented multiple other new products and categories under the Post-It Note flagship that help workers be more productive, add value, and sell like hotcakes. 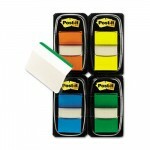 This is by no means an all inclusive list, but here are several 3M Post-It’s line extensions that you should try. Pop-Up notes are accordion style notes that let you pop your next note out of a dispenser much like Kleenex. It’s a more convenient way to pull the notes from the pad. Post-It flags are addictive little colored flags that can be popped from a dispenser and used to flag pages, mark signature areas and get attention for important content. This product line did not exist a few years ago, and today four full pages are devoted to Post-It Flags in office products catalogs. Table Top Easel Pads with Post-It adhesive are cool items that make people more productive. 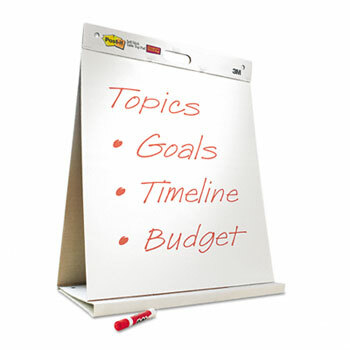 Post-It Note easel pads, while not actually invented by 3M, are also a very popular product line. Adhesive applied to the top of each easel pad page allows the user to tear pages off the easel pad, and easily stick the sheet to a wall or window surface for viewing. Most people say that once you use a Post-It easel pad, others don’t compare. Post-It Durable Tabs are a very new product line that uses 3M’s removable adhesive technology with file folder and hanging file folder index tabs. They are color coordinated and allow you to use repositionable tabs for folders to stay organized, and then simply pull off to relabel the folder. They are much easier to use than plastic inserts, look better, and are reusable. 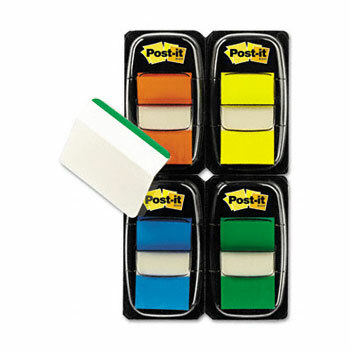 So where is the best place to find a full line of Post-It products and other great office supplies? You know by now my favorite office products company. I buy all my office supplies online from an independent office products dealer that gives back to the community by donating profits to great charities. They practice conscious capitalism as a business model, have great service, and I feel good knowing we do good work together. My advice is to never shop at the corporate Big Box stores. Service, pricing and selection just aren’t as good, and all they care about is the bottom line. Do good work with 3M Post-It’s! This entry was posted in Office Supplies Shopping Tips and tagged 3M, Avery, hanging file folders, office products, office supplies, Office Supplies Online, Pop Up Notes, Post-It Notes. Bookmark the permalink.